When most Sims hear that the Reaper is coming they want to run away, but the Door of Life and Death lets your Sim go right up and knock on his door. And you might just find that he’s not that bad after all! Want to bring a lost loved one back? Just knock at the Reaper’s door to have them reincarnated! Have a loner that wants to try parenting all on their own? Have old Grimmy Simulate a Genetic Merger with the Sim of your choosing! You can even challenge the Reaper to a high stakes guitar duel! Level up your Guitar Skill before Playing Against the Reaper - he is a master guitarist and will unleash the Pit Monster on Sims that lose the duel. However, Don’t Fear the Grim Reaper and prove yourself to win a special prize from Grim! Help your Sim start a family by Simulating a Genetic Merger with another Sim of your choosing. Call for the Reaper to hang out! Be cautious if you’re not on good terms with Grim, he may just have the Pit Monster greet you instead. 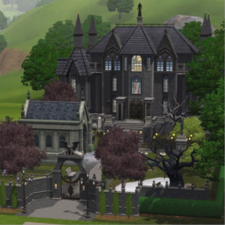 Reincarnate your dearly departed Sims and Pets, but whether they come back as a Sim or Pet is up to the Reaper! The Reaper is able to handle all of the paperwork and Rename your Sim in an instant. The Pit Monster has an appetite for those pesky Zombies and Paparazzi.